Tim & Tina's new home building blog - redevelopment in Australia! : Need wall design inspiration from our blog readers! Need wall design inspiration from our blog readers! So, for many years I've been involved in the design, creation and manufacture of vinyl signage and graphics, specialising in vehicle graphics - racing stripes, sponsor logos, etc, selling to retailers around Australia and direct sales via some websites. Anyway, no doubt you've all seen wall graphics/wall decals, a great way to modernise and decorate (plus they're easily removable, changed and upgraded), and an area in which we already have some expertise! One of my (financial) new year's resolution is to get our wall design website finally off the ground, I thought I'd ask all our very informed and trend setting blog readers to maybe make any suggestions on what you'd like to see! I've always liked the look of the black chandelier wall decal - it can reflect an existing light, or give a very luxe influence on a room. Tina found us a nice black French chandelier for the entrance (which still hasn't been installed, a year later!). I've done a few designs for chandeliers that'll definitely be on our website. Probably will leave those falling black leaves alone though. 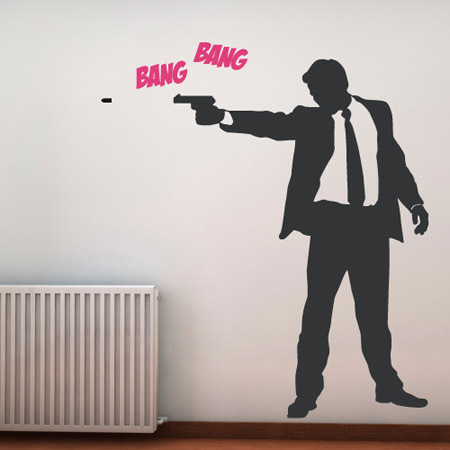 This one is pretty neat, a silhouette that reminds me of Reservoir Dogs/Pulp Fiction. Would go well in a home theatre room, teenager's retreat, or rumpus/games room! So, we've already got a website name, I'm working on the store customisation which might take another week or two, but what really matters are the designs, of course! There's already plenty of stores which supply wall decals, but we want our store to stand out. Many wall decals sold in Australia are actually mass produced in China (which is why they all look the same) - where I think our store will stand out is that everything is designed and manufactured locally right here in Melbourne, and to take advantage of that, our store will have many items that are unique and personalised. For example, you might be able to submit your child's name to be integrated into a particular design, for example "Stephanie's Room" as a stickable design, surrounded by hearts and stars for example. Naturally, a custom one-off item will cost slightly more than a generic mass-produced item, but it'll be unique and tailored exactly to your needs and your style! Of course, we'll also have some custom designs that you won't find anywhere else too. Anyway, if you have any ideas at all, what you might like to see, what you're sick of, or anything else, please leave a comment as your feedback will be greatly appreciated! Hoping to have the website launched with a few products within a month.